There is a game for everyone. In April 2018, we tried out something new: two mini talks on the theme of Game. First, Jeff Tidball talked about his love for table top gaming and how anyone can learn from playing, or creating games. Next, Austin & Matthew from Trailhead Games talk about using narrative games and play to create change. 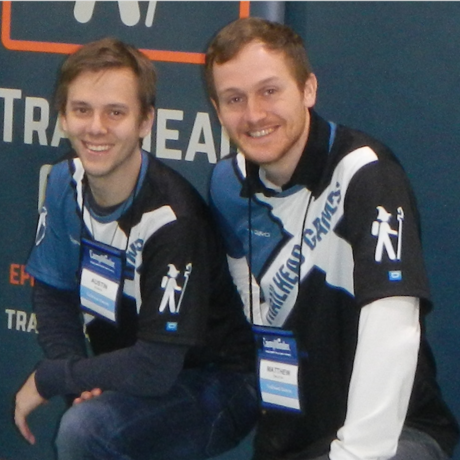 Matthew & Austin are best friends and Co-Founders of Trailhead Games, a company geared towards crafting narrative game experiences for summer camps, schools, and organizations. They have written and run over forty 100+ player programs, each with unique and relevant storylines and game mechanics. Most recently, their projects have including Climate Clash, an educational game in which 4th-6th grade students race to fund the building and development of carbon-free energy sources, and The Bill, a political activism game incorporating silly organized chaos with practical skills like initiating conversations, creating collaboratively, and organizing movements. With a worldly repertoire of creative knowledge and a passion for all things fun and games, Matthew and Austin seek to make an impact on the culture around us through the introduction of this narrative style of gaming and utilize the natural human desire to play to enhance our creativity, productivity, and joy.